The past few years have seen the commercial space industry growing at a rapid pace, and not merely in launch services. Space is a place, and requires collaboration from a wide array of industries, including yours, to enable thriving communities and businesses off planet. Joel Vinas will cover how various companies are gaining value from the space industry, and how your industry is actually space-scalable. Joel Vinas is the Executive Director of The Center for Space Commerce and Finance, the organization which manages the NewSpace Business Plan Competition. This national event has awarded over $300,000 in cash prizes to promising startups in the space sector since its start in 2006. The NewSpace BPC is the worlds’ only professional competition focused on supporting entrepreneurs with space or space-scalable business ideas. In his role with The Center, Joel has supported, coached and consulted for dozens of early stage start-ups, giving him a uniquely deep understanding of this market segment. Mr. Vinas is a Co-founder of NewSpace Chicago and currently serves as a VP of Business Development for Orbital Transports. 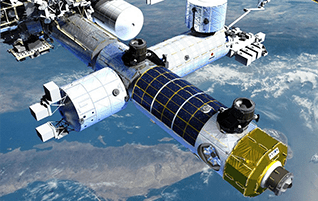 This is part of a continuing series of space entrepreneurship discussion and networking forums presented by NewSpace Chicago and hosted at mHUB Chicago. This event is free and open to the public. Copyright © 2016-2018 NewSpace Chicago. All rights reserved. NewSpace Chicago is a registered 501(c)(3) non-profit organization.